The postmen. The couriers. The Jehovah's Witnesses. The double-glazing contractors. 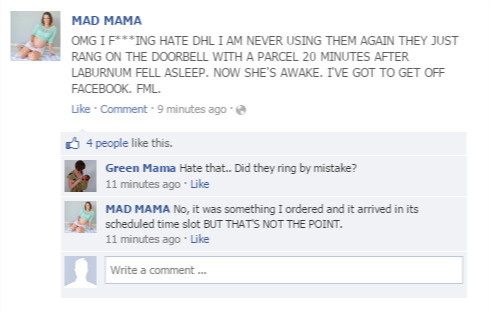 We spent 53 minutes getting our baby to sleep, and your finger resting far too long on the doorbell took two seconds to ruin all of the hard work. Now you've cut into our working/cooking/Facebooking time and left us with a super-grouch for a baby. THANKS. 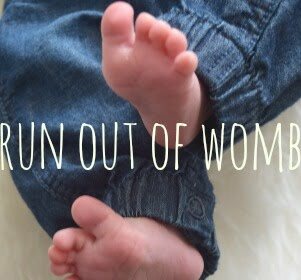 You spent the morning getting your baby/ies ready and fed and hiding all the clutter under the sofa whilst simultaneously making a Sunday lunch WITH MORE THAN ONE COURSE for non-parent friends. They asked what time was best; you said 12.30; you're feeling smug at your ability to Do It All... until the friends don't turn up... until 1.30pm with a shrugged excuse - "sorry, you know what Sunday mornings are like...". That's about as palatable as inhaling baby sick... because it means your tidied-home is already a tip and you have to get the small one(s) to sleep in the next 10 minutes and lunch burns, and the friends go home bitching about you being in a massive mood. You're on a rare night out with non-parenting friends and mention you're really knackered. They point out they just worked a 12-hour shift at the office and you 'padded around at home all day'. You politely respond that your day started with a screaming baby at 3am, 4am, and 6am and that you've been feeding/bum-wiping/chasing said baby all day and now you've been away for 19 hours and you're pretty likely to face the same schedule tomorrow, because you have done for the past eight months. But their face points out 'you did this to yourself' and you resolve not to go out, ever again. 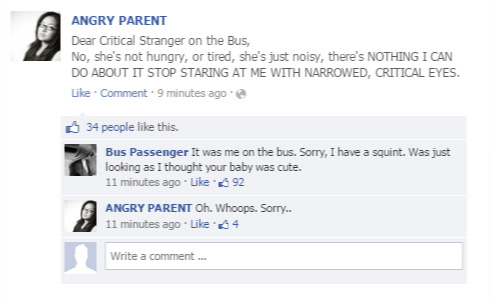 You're on the bus/at a cafe and your baby Won't. Stop. Making. Loud. Noises. It's not crying-noise. It's squawking. They're not hungry. They're not tired. There's nothing you can do. But the lady in the next seat knows otherwise. Of course she does, she's observed your baby for 3 whole minutes. She taps you on the shoulder. "Excuse me, but don't you think you should give your baby something to eat? She's making some noise, you know." You hate the critical stranger so, so much. She had a blowdry and mani-pedi whilst she was in labour (to ensure the after-photos were perfect; her baby shower was straight out of a magazine - in fact, Hello! ran a spread on it because her fourth-cousin, who once dated Prince Harry, turned up with cupcakes. Her cream-and-pale-grey nursery has pale cashmere throws for the perfect K Middy-style baby photo background... and there don't appear to be any pale yellow *or* Calpol-coloured sick-stains. What? You hate her. You'd like to say you have no Facebook post to show, because you silenced her on newsfeed. Obvs.